Do you ever wonder whether colleges and universities are really awash with trivial concerns about the use of language or whether they are actually trying to address serious concerns about discrimination and harassment? Have you ever wanted to get to the bottom of what all the fuss is about? This book is the first major study of political correctness in post compulsory education to be published in the UK. 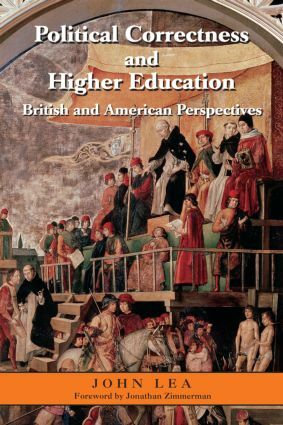 For readers in the UK unfamiliar with the nature of the controversies in US college campuses this book offers a comprehensive assessment of the key themes, including who and what was behind key campaigns. For readers in the US unfamiliar with how this cultural export has faired in the UK this book looks at the significant similarities and differences in the ways that the phrase has been used in both societies. Apart from addressing the roots of political correctness the book seeks to show how the phrase has helped to complicate the traditional boundaries between those on the political Left and those on the political Right. The book also demonstrates in clear terms how the phrase is integral to understanding key themes in cultural theory, such as postmodernism and identity politics. Finally, the book will seek to capture the reflections of prominent academics and educationalists bon both sides of the Atlantic, who have worked in environments where the phrase has impinged on aspects of their work over the last twenty five years. If you think that `political correctness’ simply amounts to what jokes you are allowed to tell in a classroom, hopefully this book will challenge you to think again.